Scripter Margaret Nagle’s chronicle of Franklin Delano Roosevelt’s life after his polio diagnosis in 1921 at the age of thirty-nine was crafted into a gripping and compassionately humanistic made-for-HBO film from director Joseph Sargent. 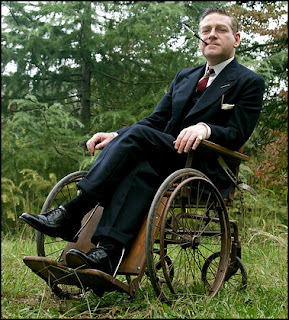 The film, which received eight awards and twenty-six nominations (including three Golden Globes), benefits from a stirringly passionate turn by British actor Kenneth Branagh as Roosevelt. Audiences first encounter Roosevelt just following his failed campaign as the vice presidential running mate of James Cox. After he’s struck with disability, FDR ventures down for rehabilitation to Warm Springs, Georgia to spend time in the hot mineral water in the hopes that he’ll regain enough mobility to begin to walk once more. At the same time, Eleanor Roosevelt (played by Cynthia Nixon who disappears into her character as well), bravely begins to come out of her shell as a political public speaker quickly becoming involved in the government while her husband recuperates. Truly indicative of the tagline that “the greatest challenge FDR faced was the one we never saw,” Warm Springs is a worthwhile and eye-opening account of the man’s struggle against prejudice towards disabled individuals. Incredibly authentic and even going as far as to ensure that disabled actors are playing disabled actors, Warm Springs is still hard-hitting today as FDR struggles to regain self-confidence in a world that celebrates the able-bodied and is fearful of others. And indeed as evidenced in the movie, FDR’s strides against discrimination and the film’s inclusion of such timely issues such as racial and disability discrimination along with health care costs and rights to American citizens make the film far more potent so many decades later. With great supporting performances by Tim Blake Nelson, David Paymer and Kathy Bates, Warm Springs is one of the best HBO films in years and--especially given the consistently amazing productions the channel is responsible for creating-- that’s saying something significant indeed.